As we announced in February of this year, the ATLA Summary of Proceedings is moving to open access and will be published on the Open Journal Systems (OJS) platform. Additionally, ATLA will produce a new publication, the Annual Yearbook, which will include materials that historically have been a part of the Proceedings. The Yearbook will also be an open access publication hosted on OJS. We will share later this summer how ATLA members can receive a print copy of the new Yearbook. 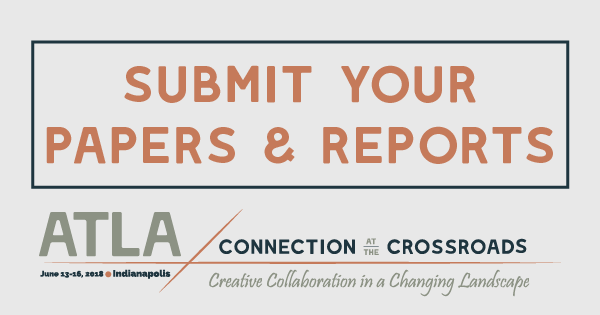 As a result of these changes, persons presenting or speaking at the Annual Conference or who lead one of ATLA’s many committees and groups will have a new way to submit their materials for publication in the new Yearbook or in the Proceedings. If after reading the guidelines and viewing the instructional videos you have any questions about the format of your submissions or how to use the OJS site, please send an email to memberrep@atla.com.